Past the palace and into Notting Hill, I loved the bus ride to this shop. In Paris, taking the bus from Dehillerin to Gare de Lyon will take you on a tour through the Marais and Bastille. Having various personal projects in addition to work related missions is a good inspiration to climb on board the buses with some destination shops in mind. In London, the bus 52 runs down from Hyde Park Corner through the Kensington Palace area (good little Chinese place there) to Notting Hill, where getting off at the stop called Elgin Crescent will take you to the neighborhood of the book shop called Books for Cooks. From what I had heard and read about it, I imagined the book shop to be a rambling labyrinth of stacks through which one might get lost, but in fact it is a one room shop that also features a kitchen. I loved the Travelers Bookshop, just nearby, it had all of my favorites. Dehellerin, for cooking, pastry, and restaurant supplies, is located along the bus no 29 in Paris, which swings through the neighborhood surrounding Les Halles. The stop is called Etienne Marcel - Montmartre. It is also located in a neighborhood that features an array of cooking supply shops along the rue Montmartre, so do stroll in the neighborhood. If you are getting a train out to Lyon, you hop back on the No. 29, and go into and through the Marais, past Bastille, and the bus deposits you conveniently at the Gare de Lyon. A very nice bus line. Is that the Traveller's Bookshop as in the film Notting Hill? I should rent that film, Betty, then I can tell you! Love your blog ! Just came back from a short trip to Paris, food - shopping among other things and amazed myselve at Dehillerin and found lots of more in that area. I hope to write about it on my blog soon ! What gorgeous photos. The last time I was in London I wanted to get to Books for Cooks, but I just couldn't squeeze it in. I just posted about Dehillerin, too! Small world! And, while you're in the Gare de Lyon, don't miss at least peeking into the marvelous Belle Epoque restaurant, Le Train Bleu. We ate there last time we were in Paris and it was simply splendid! So nice seeing a bit of London through your camera!! Lovely pics. I just found your blog, and I love it! You have such beautiful photos. :) I'm eagerly looking forward to your next post. I really like your photographs. Photography is my other love, and your photos make me want to go back to Paris and London! 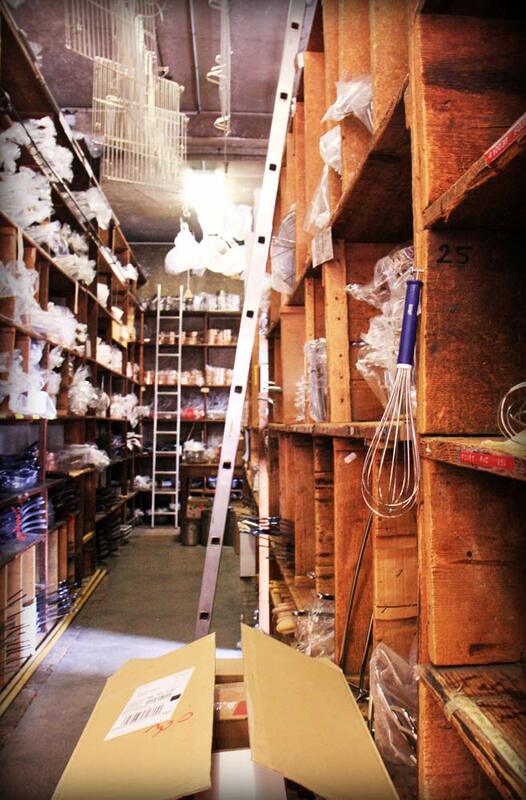 Instead, I think I will make a trip to our local restaurant supply shop today. I can't wait until I'm back in that beautiful city again. Funnily enough, I just stumbled on Books for Cooks earlier this week after forgetting about its existence. I of course walked away with several purchases loading me down (and lightening my wallet). Both of these are shops I will always remember and always return to when I'm in town! 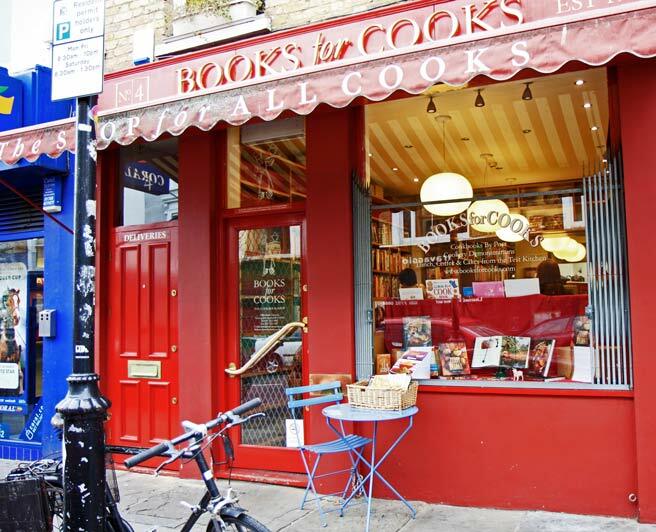 Books for Cooks is such a lovely shop. All those wonderful books in a pretty and creative setting. Thank you for sharing it with us. Oh! Books for Cooks ... to die for. I'd give a (small) body part to go. I believe the "good little Chinese place" to which you refer is the Stick and Bowl on Kensington High Street. Very nice dry fried hor fun! Thanks for your comments! And Su Lin, thank you for giving the place a name. It's this place with white bar counters where you order and a kind older man brings out the food. I have to say that what I ordered took me right back to China. I adored it. One of the first times I have had authentic Chinese that didn't cost an arm and a leg in Europe. I wonder what other ethnic eats there are to discover in London. I recognized the photo of Dehillerin before it fully downloaded - what a magical place! As for Le Train Bleu, which another poster mentions, perhaps next time as we'll be in that area. Now to hop across to Notting Hill. As usual, your photos are inviting.